A cactus that is mainly known for the barrel shaped species , Ferocactus also include other forms. This is a genus with spines, and in some varieties the spines themselves. They do flower, and again flower colour varies from pale yellows through to reds. The flowers are reasonable large and attractive. Flowers are followed by small fruits and then seed pods. The most widely grown species is F. latispinus. These are a long lived cactus, with a life span of over 50 years in good conditions. They are best grown outdoors in a container or in warm climates you can grow them in a raised rock garden. Many varieties make excellent future plants, however, with sharp spines, they need to placed away from walkways and areas where children might touch them. Generally the plants are mulched around with pebbles or fine stone for appearance. Ferocactus are best grown in a humus rich soil with some moisture. Dappled shade is They do require good sun, and a well drained growing medium. You will need to plant your cactus out, or repot it at some time.This is best done in spring, and this is about the only time it really needs watering. Once established they require very little water and should only be watered from spring to summer when in active growth, and then only in times of drought, or if you are growing them under cover. A growing medium that consists of sharp washed sand and 30% compost will work foremost species. Remember that they thrive in poor soil and full sun, so this is what you will need to replicate. F. diguetii – Largest species to 4 metres in height. F. glaucescens – Attractive barrel shaped species. F. gracilus – The Fire Barrel Cactus with red spines. Soil – Very free draining soil. 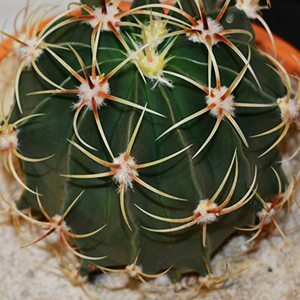 Ferocactus are not widely available for sale.